The artifact is a 1st class relic, meaning it is the physical remains of a saint (bone, a hair, skull, a limb, etc.). 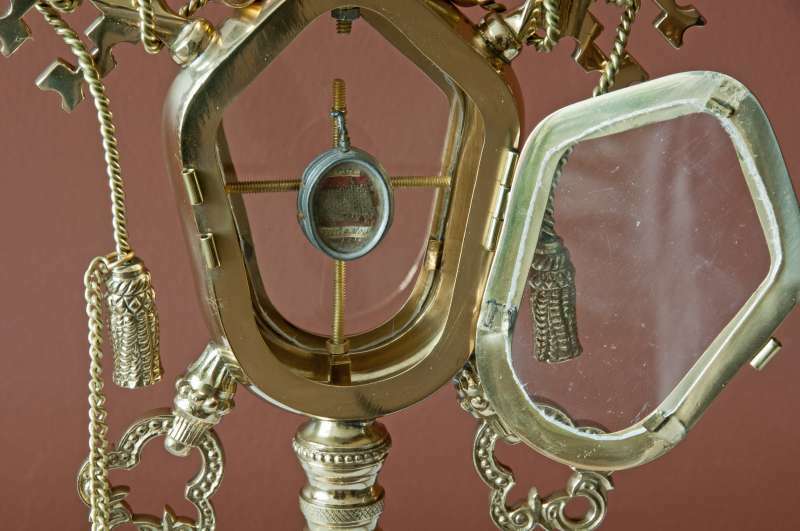 Traditionally, a martyr’s relics are often more prized than the relics of other saints. 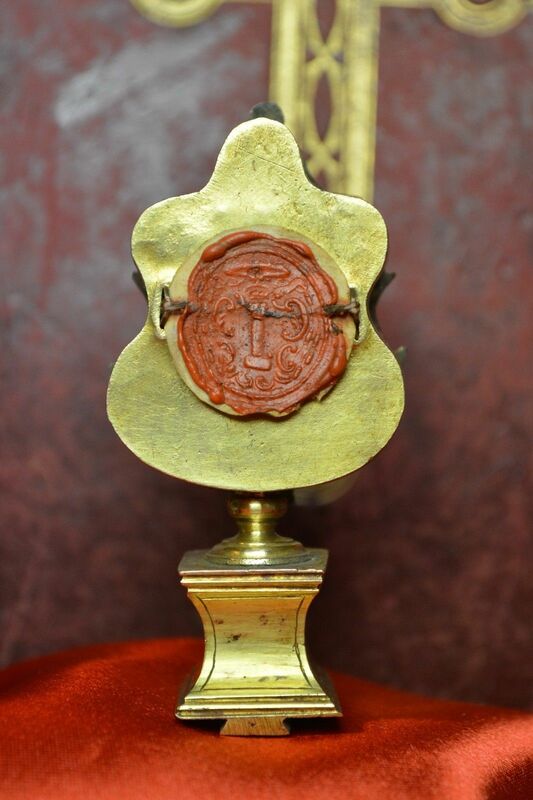 In back a very important red wax seal (of Bishop Colonna ) insures the integrity the relic. The silky threads that seal the reliquary are intact. 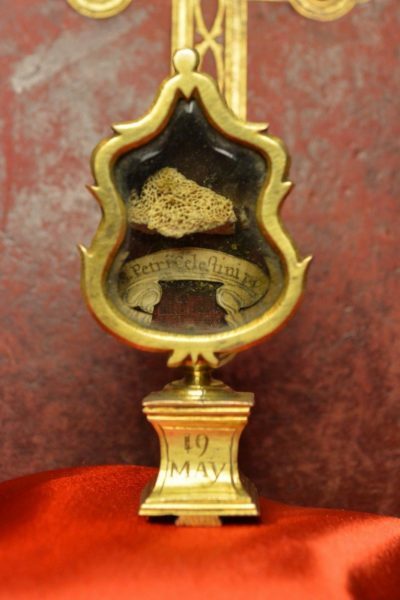 It really is quite phenomenal that this Collection includes both 1st & 2nd class relics of Pope Saint Celestine when you look at the date of his abdication: 1294. And the connection between him and Pope Benedict XVI is an historical event of unusual proportion. 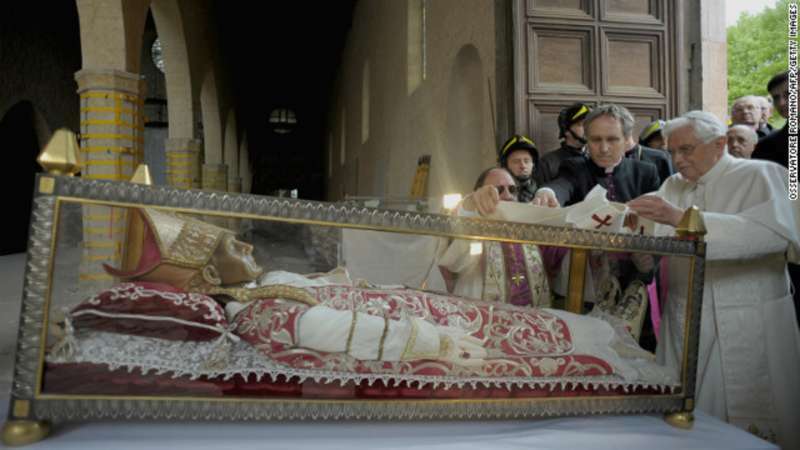 These are the comments of Pope Benedict XVI upon his visit to Sulmona in 2010 to venerate the relics of Pope St. Celestine V who reigned for five months in 1294. 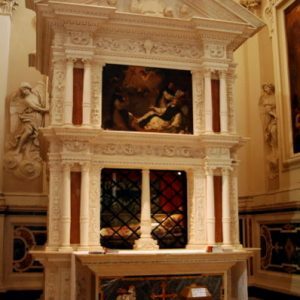 At that time, Benedict laid his pallium upon the tomb of St. Celestine. The Pope also highlighted St. Celestine’s silent attitude in search of God’s help to find his voice. In February 2013, Benedict XVI followed his example and resigned as pope. 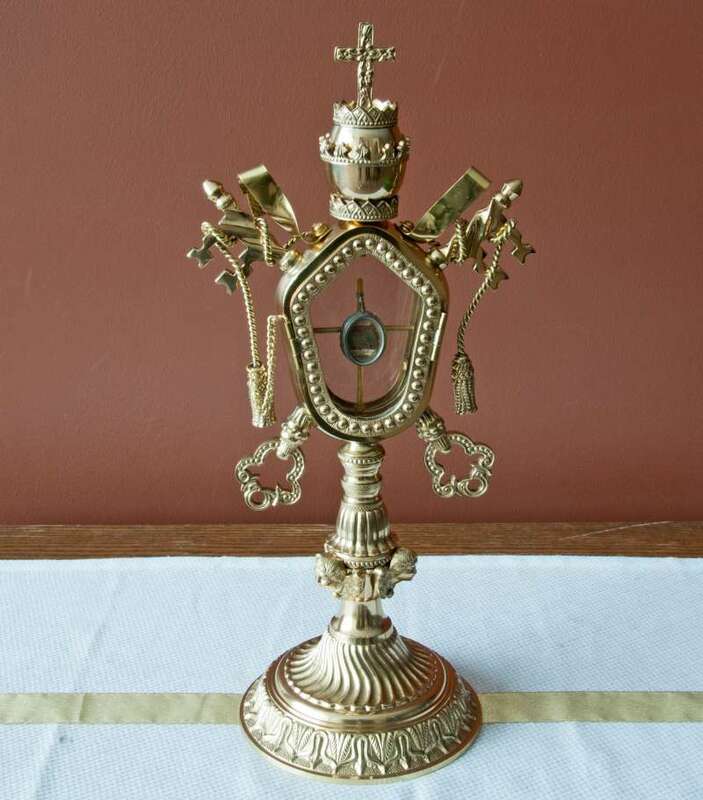 The word, relic is from the Latin reliquiae, meaning remains. Bitter wrangling and infighting and the influence of monarchies from both eastern and western Europe often marked the conclaves of the early church. Such was the case in 1292 when Pope Nicholas IV died, and the next conclave failed to elect a pope for two years. 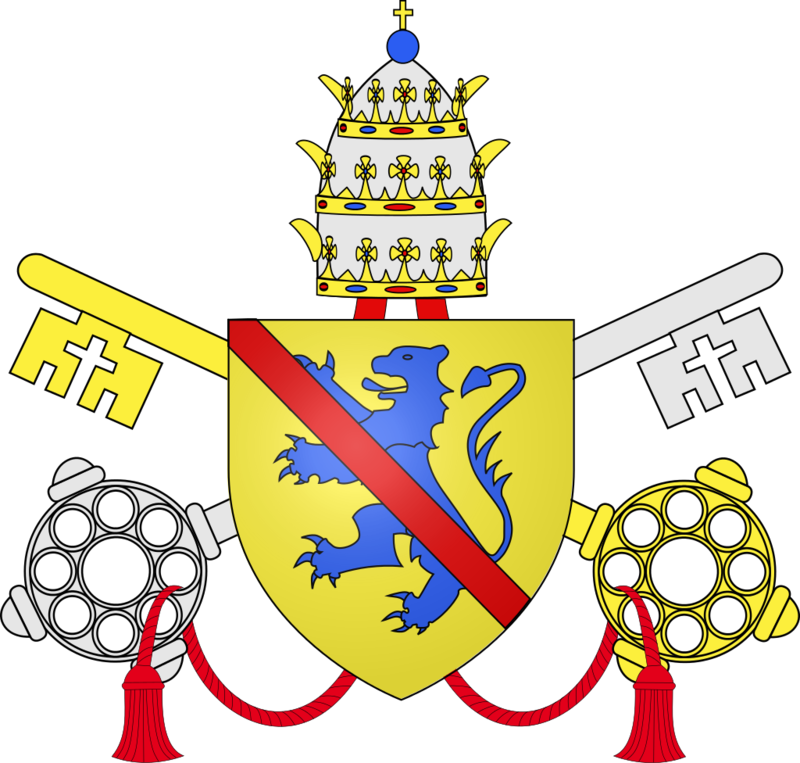 Not only was the church left without a successor to Saint Peter for that time, but also, the venue was changed four times as the interests of the cardinals caused them not to reach an agreement. In the end, a very saintly man, a hermit named Peter of Murrone even wrote a sorrowful letter urging them to decide. One of the cardinals (Orsini) told the conclave that this holy monk had warned him that God revealed they would be punished if they did not elect a pope. As a result, the conclave elected this saintly hermit who had chosen a life contrary to the one to which he now was called. 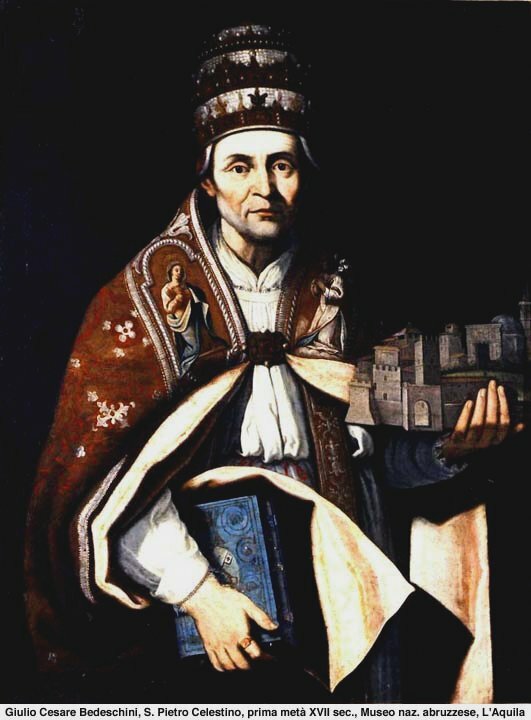 In 1294, after refusing to accept the nomination, he reluctantly considered it to be an act of obedience to God, and he became Pope Celestine V.
The son of poor parents, Peter was born early in the century, the eleventh of twelve children. His sanctity was apparent early in his life and very soon he became a hermit on Mount Murrone. To avoid the crowds of people who sought his advice he withdrew to Mount Majella, an even more remote location. Austerity filled his life. Prayer, fasting, hair shirts and iron chains were the stuff of his life. Since crowds continued to pursue him, he formed a branch of the Benedictine order, later called the Celestines. Eventually he founded the third order for laity. How could a man so totally dedicated to prayer, fasting and asceticism, a simple man who was eighty-five years old upon his election and who had lived his life in the mountains cope with the complexities faced by medieval popes? In this case the answer was, “not well.” Even the monks of his order had supported the decision of the conclave and urged him to accept. Celestine may also have been motivated by the hope of being able to reform and renew the Church in an evangelical direction. He was crowned at L’Aquila on August 29th, 1294, and made Naples the seat of the papacy soon after. 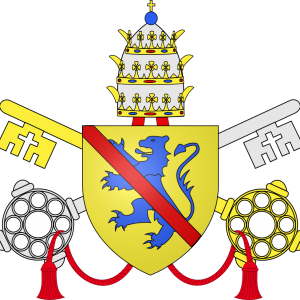 His immediate decision was to create several new cardinals who were all French or Neapolitan. He became a puppet of both civil and curial authorities. The curial officials were soon selling blank bulls. The projects dreamed of by this saintly man were systematically opposed and frustrated by the ecclesiastical hierarchy that ought to have put them in place. Celestine, old and sincerely pious, was no ruler. His decision, based on an election decree of Pope Gregory X, was to resign. He announced this decision in a papal bull where he affirmed he had this right. Dressed in full papal regalia, he read the decree, stepped down and stripped himself of all papal insignia. Dante called it, the great refusal. It is not known for sure if he was forced into this decision or freely made it, but the end result was his resignation and continued suffering. 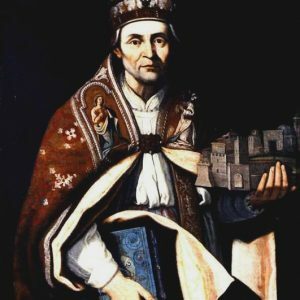 Boniface VIII was soon elected in his place and Celestine, the last pope to resign the papacy was then locked up as a prisoner in the castle of Fumone under very harsh conditions. The isolation imposed on Celestine by Pope Boniface VIII may have been to keep his many disciples away. Within a year and a half, the saintly man died on May 19, 1296. Pope Clement V canonized him in 1313. He is also referred to by his own name, Saint Peter Murrone. Until the resignation of Pope Benedict XVI on February 11, 2013, Celestine was the last pope to resign from office. 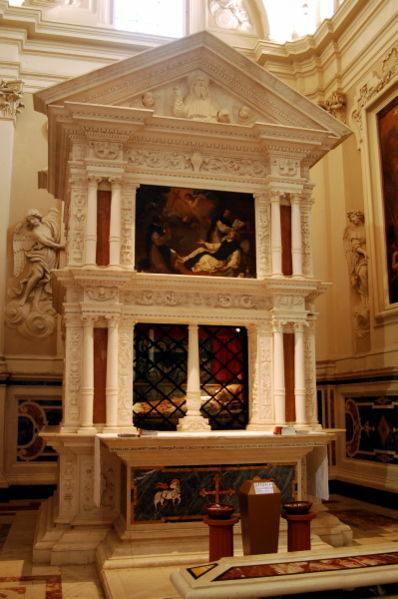 His remains are in the Church of Collemaggio at L’Aquila. Papal Artifacts honors the gift of his life to our Church. Pope St. Celestine, pray for us!